You know that point in your life when you realize that the house that you grew up in isn’t really your home anymore? Even though you have some place where you can put your stuff that idea of home is gone. You won’t have this feeling again until you create a new idea of home for yourself, you know, for your kids, for the family you start, it’s like a cycle or something. Maybe that’s all family really is. A group of people who miss the same imaginary place. 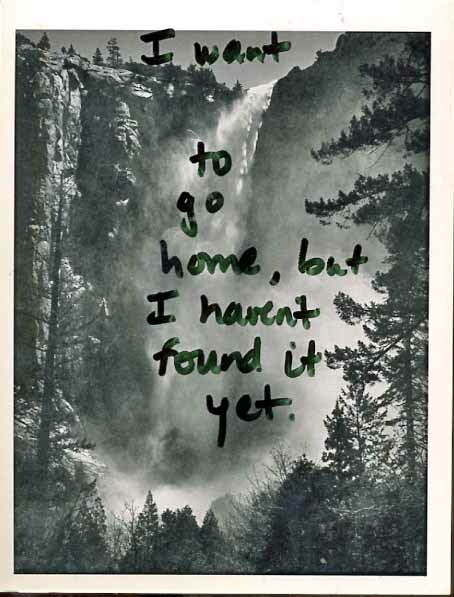 And the postcard that prompted this quote from Post Secret. I feel lucky and blessed to have a definition of home along with people and animals to fill it.